Some insecticides are harming honeybee queens and endangering entire hives, a new study co-authored by a biology professor at Acadia University says. Some nicotine-based insecticides are harming honeybee queens and endangering entire hives, a new study co-authored by a biology professor at Acadia University says. Dave Shutler said when worker bees are out collecting pollen they end up bringing neonicotinoid insecticides back to the hive, where the queen is exposed to it. "We saw some evidence that it was affecting survival of queens, it was affecting their reproductive rates, and if the queens aren't reproducing at normal rates the workers will get rid of her," Shutler told the CBC radio program Information Morning. 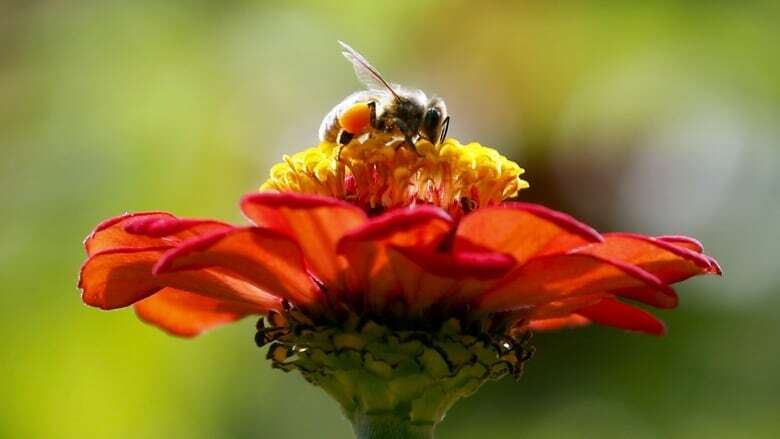 Neonicotinoid insecticides, which are sprayed on fruit, vegetables and grains to kill off harmful insects, are considered by many to be one of the main causes of the large-scale honeybee die-off occurring across much of North America and Europe. Neonicotinoid pesticides were already banned by the European Union, and are heavily restricted in Ontario. Supporters of neonicotinoids — made by companies including Bayer and Syngenta — say they have a major benefit because they destroy pests and boost crop yields. Critics, however, fear they contribute to a decline in bees, which are crucial for crop pollination. Shutler said if the queen isn't producing enough worker bees there's a chance the hive won't make it through the winter. "Workers beat their wings really fast and create heat and that keeps the queen warm so that she makes it through the winter. If we don't have enough workers in the hive when winter comes around then the hive can die." The historical mortality rates for bees over the winter is about 10-15 per cent, Shutler said. Over the last 10 years bee mortality rates in North America and parts of Europe have risen to about 35 per cent. Honeybee populations have also dropped off because of infestations of varroa mites, a parasite that feeds on the bee's blood. Those mites have been known to kill entire colonies. "There's lots of research trying to figure out: can we pinpoint a single cause? There's not really consensus yet. I think the neonics is just one piece of a much bigger puzzle of effects that are having consequences for honeybees." The study he co-authored has been published in the journal Scientific Reports.